Sixth book in an 11 part, award-winning series. Chronicles the career and personal life of Simone Biles en route to becoming a three-time world champion and an Olympic favourite. Every gymnast has an idol which he or she aspires to be like and is ultimately inspired by. GymnStars is an 11 part, award-winning book series which tells the career and personal life stories of 11 different gymnasts who each achieved the highest heights possible in their sport. These include older legends such as Mary Lou Retton (Volume 5), Nadia Comaneci (Volume 7) and Olga Korbutt (Volume 10) as well as more up-to-date stars such as Simone Biles and Aly Raisman. 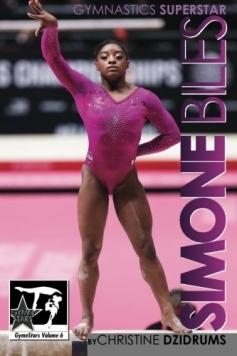 In the sixth installment of GymnStars, the award-winning children’s biography series chronicles the career and personal life of Simone Biles, the young gymnast who shattered numerous gymnastics’ records en route to becoming a three-time world champion and an Olympic favorite.